After first ignoring advice from Apple's chief executive Tim Cook not to speculate on rumors related to the company's supply chain, the Wall Street Journal has subsequently toned down its alarmist story of iPhone 5c cuts and retailer discounting. 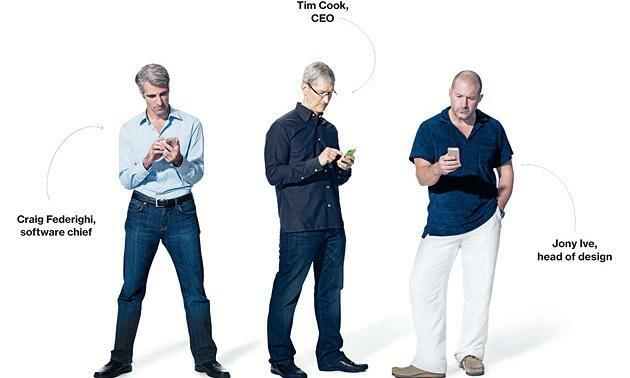 Apple executives Craig Federighi, Tim Cook, and Jony Ive; Cook with iPhone 5c. Source: Bloomberg Businessweek. Yesterday, the Journal joined Reuters and other major media outlets in targeting Apple's iPhone 5c with speculative, worrisome concerns based on assumptions and guesswork built on top of poorly conceived interpretations of unverified data. Under the initial headline "Apple Cuts iPhone 5C Orders," a report by Lorraine Luk, Eva Dou and Ian Sherr for the Wall Street Journal outlined supplier cuts it defined as less than 20 percent at Pegatron and "one-third" at Foxconn. The article didn't outline how many iPhone 5c models Apple had been building, or how many it planned to build at launch or throughout the quarter, or if the changes were planned in advance or in response to production yields. Five paragraphs into the article, the report noted, "Apple meanwhile has increased this quarter's orders for the iPhone 5S," but again it did not report how many of those models Apple was said to be building or whether rumors of production issues had played a factor in the orders changing. By the end of the day, the paper changed its headline to "Apple's Dual iPhone Strategy in Doubt," shifting the narrative to focus on the idea that Apple's plan to "broaden its appeal with a cheaper version of the iPhone [...] appears to be faltering after a few weeks." Orange didn't detail of how many units it was selling of each iPhone model, and the Wall Street Journal didn't explain how it might be better for Apple to be selling more iPhone 5c models, which would either come at the expense of the high end iPhone 5s or the lower end iPhone 4s. As it is, available data estimates from CIRP indicate that Apple's best, most expensive model makes up the majority of sales (64 percent), while iPhone 5c is second at 27 percent and lower end models are a distant third, making up less than ten percent. Despite identifying a problem to worry about, the Wall Street Journal didn't articulate a potential solution outside of backing certain analysts who have claimed Apple should somehow be selling an even cheaper 5c, an idea contradicted by the concentration of demand at the higher end of Apple's product mix. Indeed, as the Journal observed in its second edition, "the fact that the 5C appears to have missed Apple's expectations may not be all bad, especially if it means consumers are buying more of the 5S, the higher-end iPhone that came out at the same time last month and sells for $100 more." The revised version of the story also now mentions by its third paragraph that Apple is said to have increased production orders for its high end iPhone 5s. One year ago, Citi analysts Glen Yeung, Walter Pritchard and Jim Suva issued a pessimistic report on iPhone 5 demand based on "near-term supply chain orders." Not only was that information subsequently found to have inappropriately leaked to hedge fund SAC Capital, allowing that firm advanced opportunity to profit from the stock selloff Citi's predictions triggered, but the information itself was not correct. Apple's iPhone 5 was the world's top selling smartphone and continued to enjoy rapid sales even as investors began dumping Apple's stock on the "news" that its phone wasn't selling. That false information was subsequently picked up by journalists and spread around throughout 2013, creating the impression that Apple was faltering and poised to lose its leadership position to Samsung, a preposterous charade some journalists still continue to repeat, despite a preponderance of evidence against such a conclusion. Cook continued to recommend that analysts not base their predictions on supply chain "checks" throughout 2013. However, a series of analysts have continued to issue "supply chain check" reports that fueled headlines despite being, more often that not, completely wrong. "Channel checks" were cited in March as evidence of a new Apple TV set top box that never materialized. Similar "checks" were also cited in June as proof iPhone production was being cut, just before the company reported unusually strong smartphone sales over the summer. Journalists and bloggers have also jumped on the bandwagon, issuing "reports" of their own that confidently arrive at conclusions based on scraps of supply chain rumors. As analyst Benedict Evans noted, "people really ought to have learned that supply chain production volume rumours for iPhones are worthless," adding, "the 5c could be a total flop but supply chain rumours wouldn't tell us either way. Too many variables." Certain analysts appeared driven to promote such "supply chain reports" by a desire to prove that their predictions of a cheap iPhone 5c were not actually wrong. By turning things upside-down, they can use "channel checks" to affirm that it was instead Apple that was wrong for not actually doing what they said the company would do. For example, Piper Jaffray analyst Gene Munster and Jefferies' Peter Misek both made unflattering predictions about iPhone 5 sales and this year's iPhone 5c/5s launch based on "supply chain checks," then punished the company with downgrades after they were proven wrong in both cases. 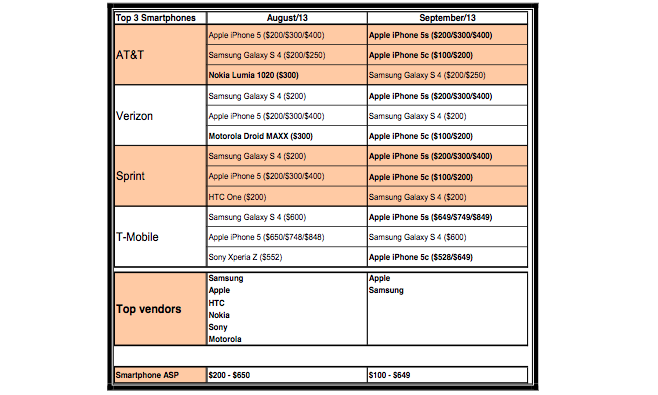 In addition to supply chain checks, media reports have also fixated on iPhone 5c price cuts, both in the U.S. and in China. The Wall Street Journal wrote that such discounting by retailers "signals that interest in the 5C has been weak." That's an incredible conclusion to draw given that iPhone 5c is within the top three smartphone models across all four major U.S. carriers, and is outselling Samsung's Galaxy S4 flagship on half of them. The Journal backtracked slightly in its revised story, stating that "reduced orders could indicate weak demand, or could signal that Apple wanted to ensure adequate supply of the 5C so that potential buyers, who were more likely to be switching from competing phones, didn't have to walk out of a store empty-handed." It noted that the "the choice of colors, and a need for retailers to have supplies of each," would have required a faster initial inventory build, and added that Apple may have built more models up front in preparation for its China Mobile launch, which hasn't yet solidified in a deal. By the end of the second story, it appears that the story is that there isn't any real story to tell at this point, just three weeks after the launch of the newest iPhones. On top of lacking a verifiable demand problem, there's also the fact that Apple itself has historically never discounted products, even ones that were not selling well. Initial editions of Apple TV (which the company's executives later euphemistically described as a "hobby") were never discounted just to move boxes, nor was the Mac mini, which also appeared to gain less traction in the market than the company had initially expected. Sales of Apple's Power Mac G4 Cube (above), an expensive machine released with unfortunate timing just as the 2000 dotcom bubble was bursting, were very disappointing to the company, but the model wasn't rapidly discounted. Similarly, while Apple doesn't detail iPod sales by individual model, certain models have been much more popular than others but none were discounted to "move" slower selling devices, and certainly not just weeks after launch. In fact, the only major product where Apple slashed the price shortly after its launch was the original 2007 iPhone, and that repricing was done after initial sales established that there was major demand for the new device, enough to warrant lowering its price to grab even more volume. "The surveys are in and iPhone customer satisfaction scores are higher than we've ever seen for any Apple product," Steve Jobs announced at the time. "We've clearly got a breakthrough product and we want to make it affordable for even more customers as we enter this holiday season." The very idea that Apple would discount its iPhone 5c shortly after launch in order to "move inventory" is bewildering to anyone who has watched the company over even just the past few years. Apple does not discount products. Also, Apple hasn't discounted its own iPhone 5c pricing, online or in its retail stores. Even many of Apple's competitors, when faced with slack sales and general disinterest in their products, have rarely resorted to significant discounting until it was absolutely necessary to clear out unsold inventories. Microsoft didn't immediately discount the Zune, or Zune HD, or Surface RT or Surface Pro until those products had suffered complete humiliation on the shelf, ignored by customers for an entire year. 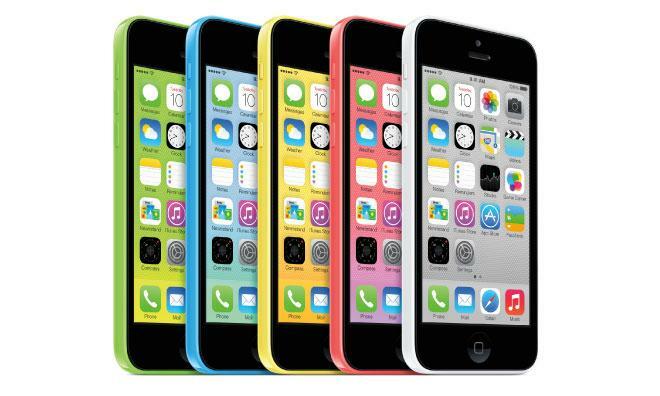 Discount retailers like BestBuy, Radio Shacks and Walmart have discounted iPhone 5c, along with certain mobile carriers. Those parties have a variety of motivations for discounting Apple's phone. Even as a loss leader, an iPhone 5c sale brings customers into their stores and sells lucrative data contracts, accessory sales and other purchases. Further, there's nothing new about Apple's retail partners, particularly discount retailers, advertising lower prices for Apple's gear, from iPods to iPhones and iPads. Amazon, Target and Walmart have all long advertised incentive price discounts for Apple's products, for example. Perhaps most bizarrely, the iPhone 5c discounts offered by a variety of retailers and certain carriers are being cited as evidence that Apple's "pricing strategy" was wrong. If Apple had priced the iPhone 5c any lower, it would be harder for Walmart and China Telecom to offer any pricing incentives of their own. Profit margins at every retailer would be slimmer, and Apple's own profits would be lower across the board. By setting the price it did, Apple gave itself, and its retail partners, additional flexibility on pricing. So not only are analysts and reporters confusing their audiences with blatantly incorrect predictions based on supply chain speculation, but they're also completely off base in their criticism of a pricing strategy that is working correctly by design, regardless of whether the iPhone 5c is selling well right now or not.